Now Available! 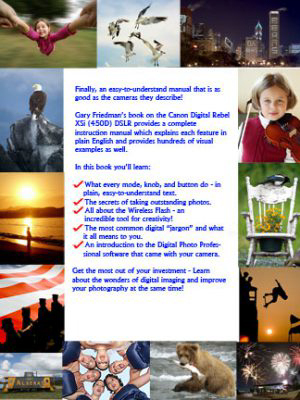 The Complete Guide to Canon EOS Digital Rebel XSi / 450D by Gary Friedman! Purchase an instantly-downloadable e-book – Only USD $24.95! Finally, an easy-to-understand manual that is a match for the camera it describes! Gary Friedman’s book on the Canon Digital Rebel XSi 450D DSLR provides a complete instruction manual which explains each feature in plain English and provides hundreds of visual examples as well. If you’ve been looking for the fastest and most enjoyable path to proficiency with your camera, you’ve found it! The secrets of taking outstanding photos that make people say, “Wow!”. All about the 7 flash modes – including an entire chapter on Wireless Flash! An entire chapter on Live View. An introduction to the image editing software that came with your camera, and how to use it to make your pictures really stand out! Click here to see sample pages and a complete Table of Contents before you buy. 2) For those of you who prefer to hold the things you read, this book is also available as a printed and bound book that will be mailed right to your door. It’s available in both Color and Black-and-White. Because this is a print-on-demand book, the color version is a little (okay, a LOT) more expensive than your typical book, but as some readers have reported, the book is quite large and the price is significantly lower than printing the .pdf file on your inkjet printer! “It is the best guide out there for [another camera] hands down…..[another company] should PAY him and bundle this book with their cameras….well worth EVERY penny.” – Eskasi on dpreview.com. Read the entire discussion forum thread.